The untouched beaches of limpid and warm waters, with different formations of coral reefs and framed by vast coconut groves, are among the best in the country. 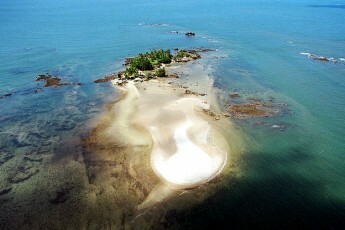 The fluvial archipelago of Una River shelters a variety of paradisiacal islands – Tinharé, Boipeba, Cairu. The dazzling Camamu Bay opens up in ten unexplored islands with primitive vegetation and coconut trees. The endless mangroves work as a nursery for many kinds of fish, crabs, shrimps and oysters. An extensive counter coast of placid waters is ideal for sailing, diving and fishing. The impressive waterfalls are the right location for extreme sports. Environmental Protection Areas preserve a rich fauna and flora. The abundance of dendê trees, spice that gives a peculiar flavor to Bahia’s cuisine, gives the final touch to the local scenery. In this paradise of great ecological diversity, nature divides the landscape with a rich historical heritage of Colonial Brazil. The primitive settlements preserve their traditional cultural characteristics.